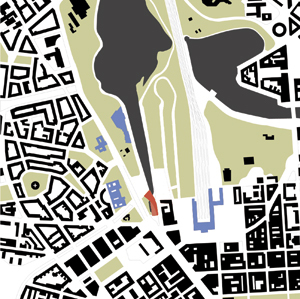 The site for Kiasma lies in the heart of Helsinki at the foot of the Parliament Building to the west, with Eliel Saarinen's Helsinki Station to the east, and Alvar Aalto's Finlandia Hall to the north. 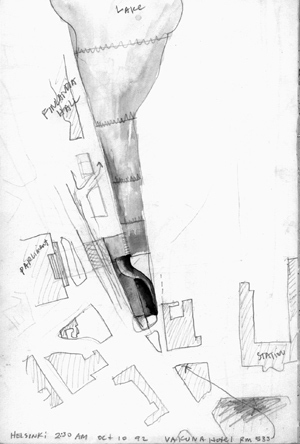 The challenging nature of this site stems from the confluence of the various city grids, from the proximity of the monuments, and from the triangular shape that potentially opens to Töölö Bay in the distance. This water extension from Töölö Bay intertwines with and passes through the museum. The rectangular pool along the west elevation is the source of a slow recirculating system which gradually lowers the water level. The gentle sound of moving water can be heard when walking through the cusp of the building section which remains open for passage year-round. The ponds are not intended to be drained. Instead, they are allowed to freeze in winter according to a detail first devised by Eliel Saarinen for the accommodation of the expansion of water during freezing. At night the west pond reflects the internal light radiating from the museum west pond which expresses a "spatiality of night." During the early evening hours of the winter months, glowing light escaping from the interior of the building along the west facade invites the public inside. Particular to Helsinki is the horizontal natural light of the northern latitudes. The slight variation in room shape and size due to the gently curving section of the building allows natural light to enter in several different ways. This asymmetrically drives movement through a series of spatial sequences. In this regard the overall design becomes a slightly warped "gallery of rooms," where the spatial flow emerges from the combination of the horizontal light-catching section and the continuity of the internal space. This curved unfolding sequence provides elements of both mystery and surprise - which do not exist in a typical single or double loaded orthogonal arrangement of space. 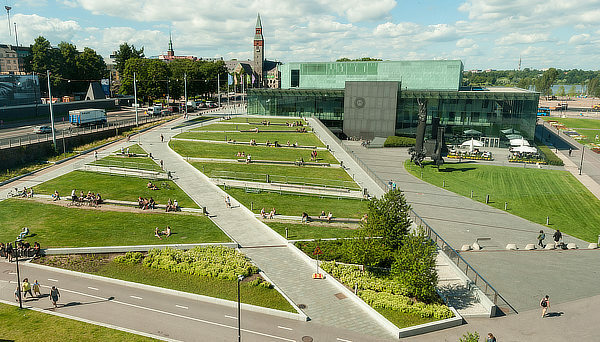 Instead, the visitor is confronted with a continuous unfolding of an infinite series of changing perspectives which connect the internal experience to the overall concept of intertwining or Kiasma. This open-ended spatial system suggests an expanse that lies beyond, in contrast to rectilinear organization and "centered" composition that dictates the viewer's movement, or an expressionist dynamic that excludes the serenity necessary for viewing some types of work. The spaces of the intertwining curves in Kiasma avoid both the rigidity of a classical approach and the excessive complexity of expressionism. The dynamic internal circulation, with its curving ramps and stairs, allows for an open interactive viewing, inspiring the visitor to choose his or her own route through the galleries. Unlike a hierarchical sequenced or ordered movement, this open- ended casual circulation provokes moments of pause, reflection, and discovery. Another concept behind the building's spaces is to create silence by eliminating the intermediate scale in the building's architecture. In this way, the art work can occupy the intermediate scale in contrast with the neutral mass of the wall. Rather than articulating columns, moldings, window openings, etc., the architecture is expressed through details such as the twist of a door handle, the edge of a stair, the exposed thickness of a slab of glass. 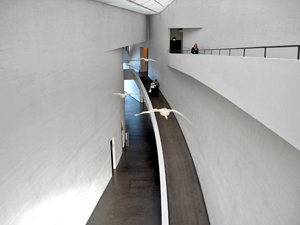 A common problem in the design of an art museum with galleries on multiple levels is that the stacked section only permits natural light to enter the upper level galleries, leaving the lower levels exclusively dependent on artificial light. In the Museum of Contemporary Art, Helsinki, we address this problem in two ways. First, the curved roof allows secondary skylights while horizontal light is deflected down through the section along the center. Thus natural light is able to penetrate both upper and lower levels. Second, the curved roof section with its "refracting" skylight introduces another means for distributing light to galleries below the top level. Because of the building's curving and intertwining morphology, because of the interwoven torsion of space and light, we have allowed for the different levels to be naturally lit. There is a correspondence between the internal nearly rectangular spaces, and the exterior's continuous uninterrupted surface. 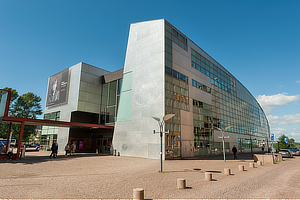 Kiasma also serves as an "Art Forum", open and flexible for staged events, performances, dance, music, and seminars. The particular placement of the cafe at ground level - open to both the garden and the lobby - makes it adaptable to informal events, such as poetry readings or "round table" discussions. The auditorium, equipped with the latest video projection capabilities, has a continuous glass rear elevation, making it visible from the outside passage through the building. When there is a lecture taking place in the theater, this open view might draw in observers who are walking along the passage, to take part in the discussion. With Kiasma, there is a hope to confirm that architecture, art, and culture are not separate disciplines but are all integral parts of the city and landscape. Insinööritoimisto OY Matti Ollila & Co.